State fire assistance has been mobilized under the Washington State Fire Services Resource Mobilization Plan in support of local firefighters working to contain the North Maple Fire, located in Cowlitz County near Kelso. The North Maple Fire is burning in timber, brush, grass, and slash. 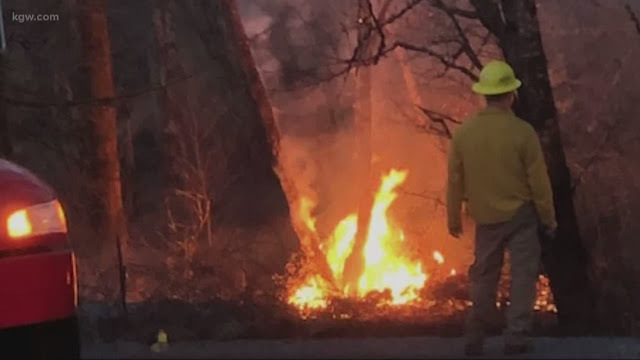 Washington State Patrol Chief John Batiste authorized the mobilization of state firefighting resources on March 20, 2019, at 10:00pm at the request of Fire Chief David LaFave, Cowlitz 2 Fire and Rescue. This is not the first wildfire of the year, but it is the first one requiring state assistance. There were so many mobilizations last fire season that it was a serious strain on state resources. Lands Commissioner Hilary Franz has asked the legislature for $55million to mitigate the effects of fires, both prevention and fire fighting. According to Wildfire Today, "This year, DNR responded to about 1,700 wildfires – second only to the number of wildfire responses in 2009. Smoke from this year’s fires at times gave Washington the worst air quality in the world, and numerous fires forced families to evacuate their homes." The North Maple Fire started on March 20, 2019, at approximately 4:50pm. This fire is estimated at 40 acres and growing. It is threatening homes, agriculture and infrastructure. Level 3 evacuations are in effect at this time. The fire cause is thought to be an illegal brush fire. Mobilization specialists from the Fire Protection Bureau have ordered one wildland strike team and one helicopter. The State Emergency Operations Center at Camp Murray is activated to Level 2 to coordinate state assistance for the North Maple Fire. State Fire Marshal’s Office personnel are en route to the scene to coordinate dispatch of resources. Under the State Fire Services Resource Mobilization Plan, the Fire Protection Bureau coordinates the initial dispatch and continued administrative oversight of resources and personnel for the duration of the mobilization. The Mobilization Plan is implemented to provide a process to quickly notify, assemble and deploy fire service personnel, equipment and other resources from around the state when fires, disasters or other events exceed the capacity of local jurisdictions.